Kathy Caldwell is a native Chicagoan and grew up in the Lakeview area and currently resides in Roscoe Village. She is a Chicago Police Officer for the past 22 years, and finds working with the community a rewarding experience. Kathy is very active in the LGBT community and is the treasurer of the Lesbian and Gay Police Association (LGPA-GOAL). She participated as an umpire for the Gay Games VI in Sydney and was responsible for security on behalf of LGPA-GOAL Chicago for the Gay Games VII, as well as having competed in softball. She also was on the Board of Directors for the Chicago Gay Games VII, in which she was a Liaison between the Police Department, the city and the Gay Games. She helped coordinate the volunteer security that LGPA Goal Chicago provided for the Gay Games. 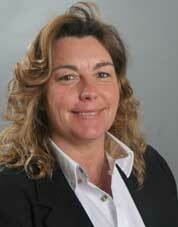 Kathy has played a variety of sports including volleyball, softball, bowling, rugby, and cycling. From these activities, Kathy is currently the sports coordinator for the Womenâ€™s Police Association, captain of the Womenâ€™s Police volleyball and softball teams, member of the Chicago Metropolitan Sports Association and the International Police Mountain Bike Association (IPMBA). Previously, Kathy held the position of President of the Womenâ€™s Sport Association Bowling League for seven years. Kathy and the President of Goal Jamie have also taken the lead in organizing a team of Goal members to ride in the AIDS ride for the past five years. Academically, Kathy received her A.S. with background in technical skills, B.A. in Liberal Arts with a minor in Sociology from Northeastern Illinois University and has received M.B.A. in Education from DePaul University.